Hello there! Today I have a transatlantic card to share so to speak. Its a project I started in Ukraine, worked on at one of the airports during our layovers (on our way to the US) and finally finished and photographed it here in the US. Crazy, right? This is one of those “simple as can be” cards, yet those that take too much time to create. 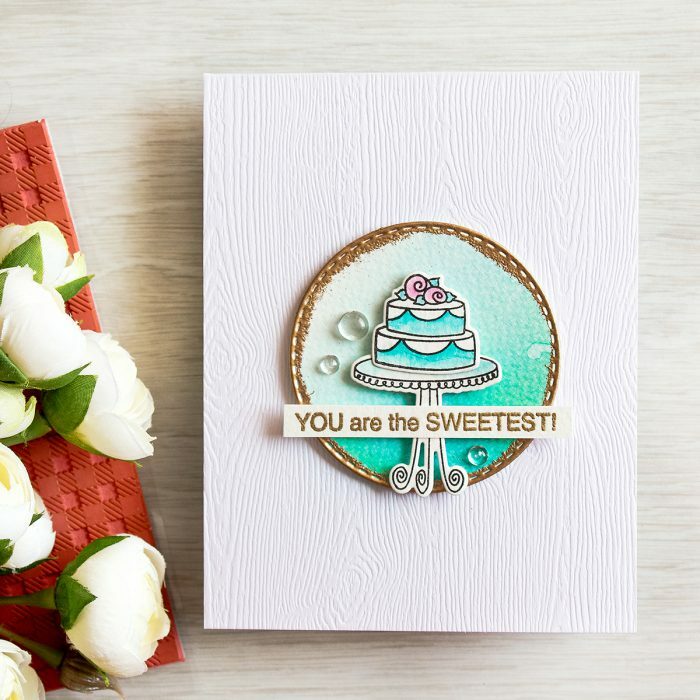 I used Simon’s Sweet Cakes stamp set and coordinating dies to create the little teal cake and stand. I stamped it in Intense Black ink and watercolored using Peacock Feathers and Tumbled Glass Distress ink. I just love these colors! 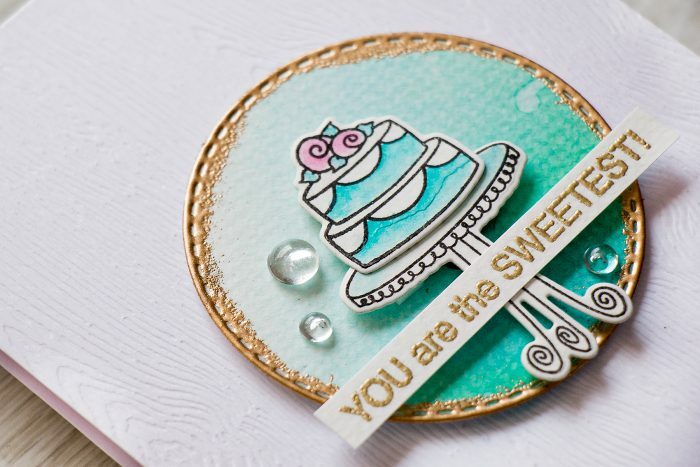 The circle behind the cake was created by blending Distress ink onto watercolor paper, adding drops of water, die cutting using Stitched Circles dies and heat embossing the edge in Antique Gold embossing powder. I need to remember to use this trick more often, I really like this embossed edge look. 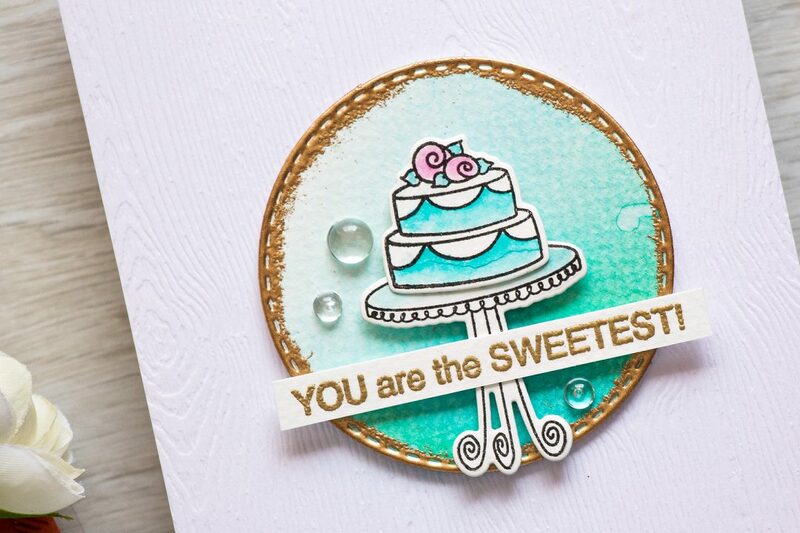 The sentiment, You Are The Sweetest, was embossed using same Antique Gold embossing powder and trimmed into a strip. I also added a few little drops as accents. What makes this card pop, in my opinion, is the white woodgrain cardstock. I just adore this texture and want to use this paper on every card I make! Beautiful card, Yana! I love the colors and the embossed edge! Very pretty Yana, the gold edging takes it up a notch. Just lovely! haha 🙂 no heat embossing on the plane, thankfully 🙂 but it was a fun project to make for sure. thank you!